The ruling Saenuri Party on Wednesday elected Rep. Lee Hahn-koo as their new floor leader in a boost for party chairwoman Park Geun-hye. Rep. Chin Young automatically became the party’s new chief policymaker as Lee’s running-mate in the voting conducted at the National Assembly among the lawmakers-elect. Lee came out the winner of a tight run-off against reformative contender Rep. Nam Kyung-pil by winning 72 votes out of 138. Nam had 66 votes, while Rep. Lee Ju-young was dropped in the first-round vote. Lee’s win is expected to tighten Park’s grip in her drive towards the presidency as one of the key members of the pro-Park faction. The Saenuri Party, despite its majority 150 seats in the new 300-member Assembly, is reeling from the ingrained factional dispute between pro-Park members and those supportive of President Lee Myung-bak. The party is slated to elect a new leadership to join Lee and Chin at the national convention next Wednesday. 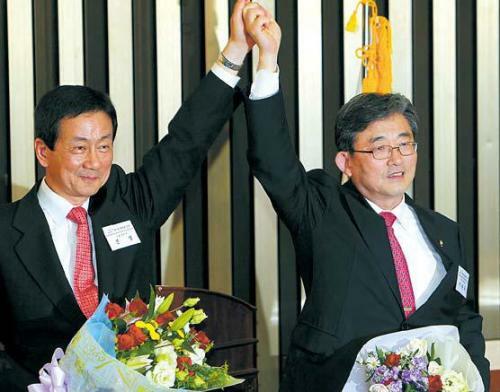 Rep. Hwang Woo-yea, who won his fifth term in the constituency of Incheon in the April 11 general elections, is consider the most likely chair as a veteran politician representing a metropolitan region where the ruling party trails behind progressive parties in popularity. Upon his win, Lee held a press briefing and emphasized his plan to alleviate factional discord for the sake of a successful presidential election in December. “If (the factions) are to grow further apart, the people will not forgive us. We have to show (the voters) the new us until the presidential election,” Lee told reporters. “Our policies for the presidential race will be much different from the general elections … we will base our personnel recruitment based on ability and expertise rather than what faction one belongs to,” Lee said. Lee enters his fourth term in the 19th Assembly representing the constituency of Daegu and is the only incumbent lawmaker that belongs to the Institute for the Nation’s Future, a purported think tank for Park. Nicknamed the “economic tutor” for the presidential hopeful, Lee is said to be the most suitable candidate to draw up economic pledges for Park. Lee, who hails from South Gyeongsang Province, walked an elite career path by graduating from the prestige Kyeongbuk High School and Seoul National University. He received his doctoral degree in economics from Kansas State University and passed the state administration exam in 1969. Lee served mostly at the Finance Ministry and joined the private research center run by Daewoo in the 1980s. He entered politics by winning a seat for the 16th National Assembly in 2000. He has acted as the conservative party’s chief policy maker twice and had headed the Assembly’s special committee on budget. While Park refrained from showing her support for a specific candidate for the Wednesday election, Lee has openly been the staunchest supporter of Park among the three contenders. Lee’s campaign slogan during the April election was to “make Park Geun-hye the next president,” with an aim to create a “proficient, transparent and corruption-free” government. Chin Young, in the meantime, once served as a chief of staff for Park but was briefly distanced from the pro-Park faction by joining the rival faction led by Rep. Lee Jae-oh around 2010.